FOBA Mosaic, developed from unconventional thinking, is a disruptive technology applied to plastic marking to reduce waste, improve efficiencies and add traceability to reduce the costs of production. The patent-pending innovation uses a unique image tiling concept to simulate a down view from within the laser. The down view is critical as it eliminates perspective distortion, a major limitation of existing technologies. The industry is craving technology that reduces the costs of production and expensive tooling, improves quality and streamlines processes. That is exactly what Mosaic delivers. The benefits and the lessons learned will be shared during this session. The presentation will introduce Kurz and PolyIC before going on to discuss HMI trends in automotive, plastic decoration by Kurz and Burg Design, touch sensors by PolyIC, integration of touch sensors, use cases of decorated plastic parts with integrated sensors, and a roadmap of HMI trends. Steve will tell the interior design story of the Speedtail, McLaren’s new three-seater Hyper GT with central driving position. The car has a £2m price tag and is limited to 106 units, all of which were sold before the project even started. With a price tag like this, customer expectation is sky high and the pressure was on to deliver something truly special. The car is designed for maximum customization opportunities, which is where the future of ultimate luxury is going. Each customer has a designer assigned to him/her to develop colors and materials that will be unique for each car. The story of the Speedtail is unique and gives a great insight into what is happening in hypercar design. Interior and exterior decoration in the automotive industry is evolving at a rapid pace. Weight reduction and the environmental aspects are important, and quality standards should be maintained with current modernized design elements in automotive decoration. 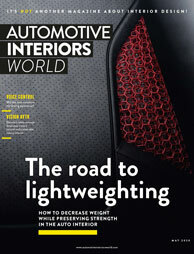 For weight reduction in the automotive industry, the use of plastic is continuously increasing. Several plastic materials can be used with Cromatipic technology, where plastic parts are metalized to look like chrome. Alongside this is an environmentally friendly and Cr(VI)-free technology that can achieve different surface finishes based on OEM requirements. The automotive industry has diversified interior and exterior requirements. The presentation will discuss a few specific OEMs and their standards that can be fulfilled with Cromatipic. Industrial printing is a 'multilayer' problem, with multiple solutions. Partial coating, precise layers from print to print and the combination of functionality and decoration are typical challenges in this part of the industry. Machine solutions from Thieme are designed using knowledge gained during four decades of close collaboration with customers. The standard machine line-up is able to be configured directly to customers’ products and, if requested, Thieme integrates its printing know-how in customers’ full automatic production lines. The presentation will show how Thieme has created solutions to these challenges. Printed electronics are intrinsically cost-effective and comprise unique qualities from which interactive surfaces can benefit. In the user interaction, optical and touch functionalities are key to an intuitive, effective way of communication. Besides the functionalities, the technology that is used for creating smart surfaces by thermoforming and injection molding is unique. Material design for printed electronics is also generating opportunities that will be discussed in this presentation. VOC is a big issue for plastic processing and for the usage of plastic parts. The Kunststoff-Institut Luedenscheid has developed a new method to detect emissions during the injection-molding process. This new technology provides new insights for material modification, protective tool coatings and optimal process parameters. In addition, optimal prerequisites can be created to successfully pass later emission testing of the part (e.g. VDA 278). The presentation will discuss new haptic decorative trim designs for automotive interiors, manufactured via the film insert molding process. The designs are realized by first- and second-surface screen printing of thermoplastic films. The first-surface decoration can be protected by chemically and abrasion-resistant dual-cure lacquers. A new carbon-free black color shade based on non-conductive Spinel pigments is available for functional IMD/FIM parts in automotive interiors now. This black color shade for screen printing applications can be used for decorating films as well as for back printing of conductive pastes within functional capacitive-touch IMD/FIM parts due to their high electric resistance. The presentation will discuss: decorative surfaces for deep-drawing aluminum solutions; embossed surfaces produced in rolls and tooling; bonding systems for hybrid parts in aluminum and plastics; light integration with laser-perforated surfaces; cool touch with aluminum foils. As innovation in the automotive industry reaches new levels, and interest in electric vehicles grows, the need for sleek, integrated touchscreen film technology is rising. Manufacturers must be ready to respond. Trends indicate a dashboard with a continuous matte surface, with embedded displays, often lit only on demand, and harmonized with the rest of the interior. This requires homogeneous, hardwearing, aesthetically pleasing surfaces. We will talk about our formable automotive-compatible gloss and antiglare films that allow design flexibility to meet this requirement. It is achieved by our established XtraForm process and successful XMAPP QPS service. The presentation will define good seating before moving on to discuss the development procedure for ride comfort, theory and validation methodology, and ride comfort for future vehicles. Nakan, a Westlake Chemical company, produces the PVC slush molding compound NAKAN®DrySol. It has 30 years' experience, delivering material to more than 10 million cars every year for soft surfaces of instrument panels, door panels and other interior parts. Nakan has recently developed a specialty ink – NAKAN®PrintSol – and a robotized digital printer able to print on curved surfaces of instrument panels. This technology is so precise that it allows inkjet printing on embossed or debossed details such as fake stitches. This innovation opens the road to full customization of the automotive interior. A composite light-guide technology enables large area uniformity in automotive surface backlighting. Space constraints and complex curves make the backlighting of surfaces difficult. Furthermore, the joining or integration of surface materials, such as cloth, wood, decorative foils and metal, is challenging. The composite light-guide technology allows LEDs and light intensity distribution optical features to be embedded inside and distributed throughout transparent films. When surface materials are bonded directly onto the light-guide surface, greater control of the light distribution can be achieved and high levels of uniformity of backlighting delivered. Environmental requirements, translated in a continuous search for weight saving, can be realized without compromising styling, functionality or performance. Case studies from the automotive and transport industries will illustrate how ARPRO-EPP made this possible through a combination of creative engineering, process improvements and material developments. The presentation will discuss putting numerical data behind the human sense of touch in auto interior materials. The technology of plastic metalization has attracted the attention of designers and important industrial sectors for many years. Increased environmental awareness has led scientists and engineers to develop alternative surface technologies and coatings. Oerlikon Balzers has developed ePD (embedded PVD for Design Parts), a surface technology that not only provides the glossy look of metal – the most popular being chromium – but also meets the high protective requirements that a coating needs to deliver. Repty DC100 hard-coated resin film is designed for resin cover lenses of display surfaces for decoration and hard surfaces. Cover lenses made from resin are lighter and more formable than glass cover lenses. Riken Technos aims to add good scratch resistance and optical performance to resin cover lenses by providing coating and substrate forming technology. Riken Technos offers hard-coated film for flat displays and IML 3D displays. The presentation will discuss fog testing of auto interior trim, gravimetric and reflective testing of auto interior plastic components, and OEM, DIN, ISO and SAE fog test standards. The world is waking up very rapidly to the need to improve environmental performance in plastic materials for a wide range of applications. Automotive components are a large part of this challenge. In this presentation we will focus on some of the latest developments and directions. Mondi's multifunctional thermoformable skins offer good mechanical performance at a lighter weight, improved sound insulation and simple processing for many interior and exterior car parts. The company's customers are headliner, underbody shield and carpet manufacturers from all around the world. The easy handling of its products and combined functionalities allow for faster and more efficient car part production. Mondi's unique extrusion layering technology can improve the performance of non-woven, paper, aluminum, polyamide and glass veil substrates, resulting in a tailor-made automotive skin co-developed with customers. Marco Tuninetti from FCA and Adriano Odino from Renolit will explain a new glass-fiber composite material that covers the glass fibers completely. Unlike common glass fiber mats, RENOLIT TECNOGOR does not release fibers into the production environment, and no fibers migrate out of the final part. It is a lightweight thermoplastic composite material based on polypropylene and glass fibers extruded in sheets or rolls. Marco will explain why the material was chosen for the rear shelf of the Fiat 500X. Many thermoplastic automotive interior parts are painted – an unnecessary secondary operation that adds more than 30% to the total cost of parts. A proven alternative exists. Parts manufactured with Molded-In Color (MIC), provided by a masterbatch, look great, support OEMs' goals for cost reduction, and also offer a more environmentally sustainable solution than paint. MIC does pose challenges, but these can be managed. This presentation will explain these challenges and offer tips on overcoming them. It will also highlight recent developments in masterbatch formulation and computer simulation that greatly increase a manufacturer's ability to successfully transition from paint to MIC. Joubert designs and manufactures products for vehicle interiors. For over 20 years the company has been working with the main automotive Tier 1 and OEM companies. Thanks to its know-how in knitting, weaving, plastic injection and confection, Joubert provides customers with complete assembly solutions. It supplies nets, straps, cords, gear-lever gaiters, overmolded products, plastic injection parts, leather/TEP wrapping, and semi-finished products. Joubert is also willing to innovate and propose new solutions for car interiors (customization, functionality, technicity, etc.) according to new trends in the automotive sector. Its integrated fiber-optic strap is a good example.